THE JUVENILE HOCKEY TEAM IS COMPOSED ENTIRELY OF BOYS FROM GRADES XI AND XIII, AND OF BOYS WHO GRADUATED FROM THE SCHOOL WITHIN THE LAST YEAR OR SO. 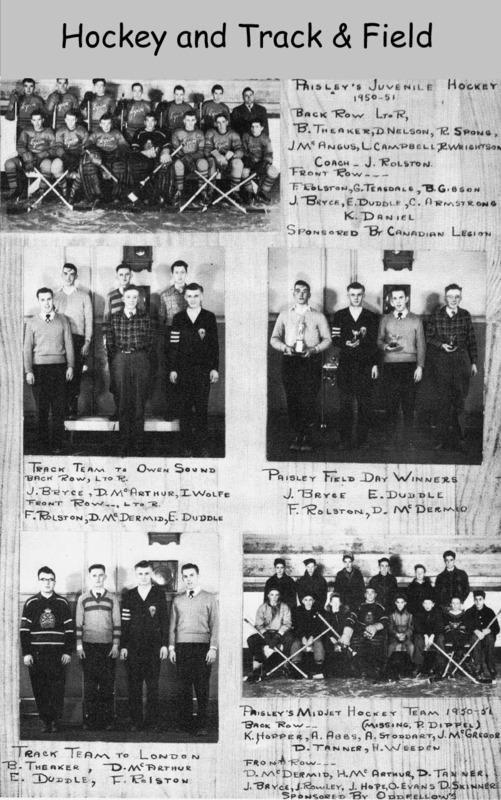 THIS TEAM OF THIRTEEN PLAYERS, SPONSORED BY THE LEGION WAS COACHED BY JOHN ROLSTON,AND MANAGED BY WINSTON SHOEMAKER. THIS TEAM ENJOYED ONE OF THE MOST SUCCESSFUL SEASONS IN IT'S HISTORY, IT WAS ENTERED IN GROUP TWO OF THE W.O.H.A. JUVENILE SERIES. THIS INCLUDED "C" TEAMS FROM CHESLEY, WIARTON, AND SOUTHAMPTON, AND "D" TEAMS FROM PAISLEY AND ALLENFORD, KILSYTH MIDGET "C" ENTRY ALSO PLAYED IN THIS GROUP. PAISLEY LOST ONLY THREE GAMES DURING THE SCHEDULE. IN THE SEMI-FINALS PAISLEY OVERWHELMINGLY DEFEATED DUBLIN, THIS WIN BROUGHT PAISLEY INTO THE FINALS. IN THIS ROUND, PAISLEY DEFEATED LUCKNOW IN THE LAST GAME, BUT PAISLEY LOST OUT ON THE ROUND BY EIGHTEEN TO FIFTEEN. THIS ENDED PAISLEY'S PLAYING SEASON, BUT NEVERTHELESS, THE BOYS WON THEMSELVES A HOST OF FRIENDS BY THEIR COURAGEOUS BRAND OF HOCKEY. AS A REWARD FOR THEIR EFFORTS, THE LEGION IS CONSIDERING BUYING THE BOYS LEATHER JACKETS IN THE TEAM COLOURS, GREY AND RED.